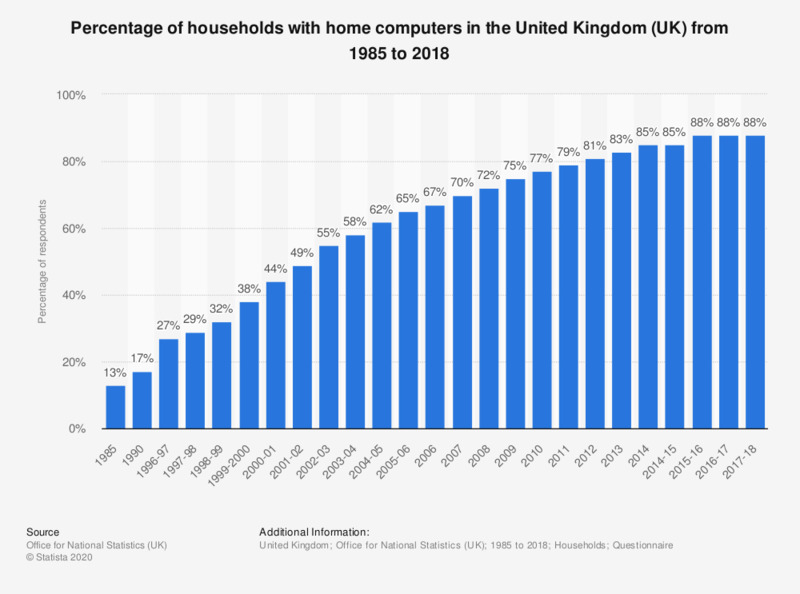 The statistic shows the percent of households in the United Kingdom (UK) that own a home computer, also known as a desktop computer. In 1985, when this survey initiated, only 13 percent of households owned a home computer. As of 2018, that number has increased significantly to 88 percent of households. Computers have basically become a necessity in the modern world. They are used to communicate, gaming/entertainment, shopping, working, and much more. Although the percentage change in the sales volume of computers declined after the financial crisis in 2008/2009, it has been on the rise in recent years. Consumers purchase computers at different frequencies and for different reasons, but with computer penetration levels as high as they are it is not that computer retail sales are in a good state. Do you have access to a desktop computer at your home?